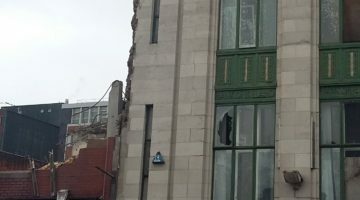 You are here: Home > News > Listed Bank Suffers Damage in Latest North Street Demolition. 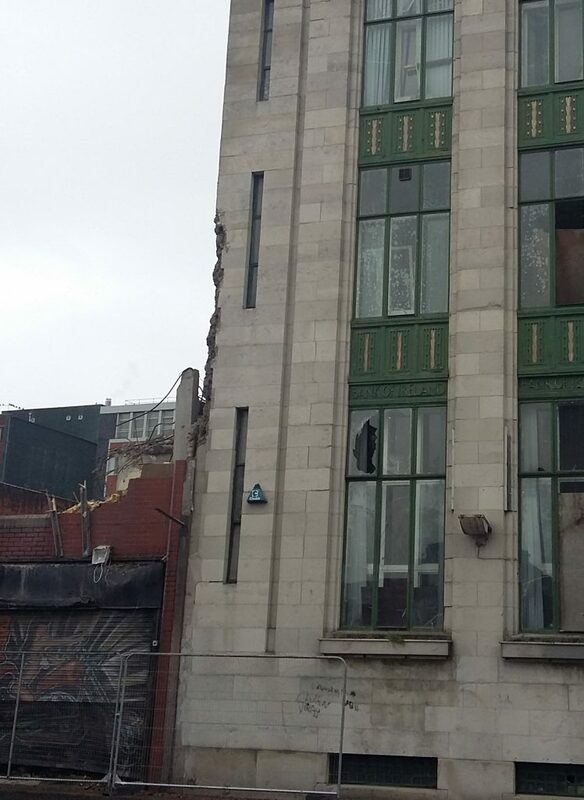 Following on the loss of three 'nearly listed' buildings on Belfast's North Street, November 2016, further demolition has caused damage to B+ listed, landmark, Art Deco building, former Bank of Ireland, 92-100 Royal Avenue, located on a junction with North Street. With repeated damage and demolition, what is being done to stop the destruction of our built heritage? The Council?s Development (Arts) Sub-Committee met with NIO Environment Minister Angela Smith to lobby for the increased protection of the city?s historic buildings. On the agenda of the meeting were the listing of buildings, the lack of action against those who allow listed buildings to decay and penalize those who illegally demolish listed buildings, and the inadequacy of resources for the protection of the built heritage. After a further 12 years of losses there appeared to be cause for optimism that the problem may be solved when the eleven new Councils took over a suite of suitable policy and powers in April 2015. These included planning, enforcement, together with some tools for designation for the protection of the historic environment. However, there has been no indication that any regulatory or monitoring procedure has been activated to prevent ongoing loss and damage to Belfast’s irreplaceable built heritage. With Belfast City Council failing to respond to detailed UAHS questions regarding Council actions before and following the November 2016 demolitions. A recent letter from BCC to UAHS further postponed the council’s response. UAHS has researched ownership of the demolished buildings and the damaged listed bank. Land and Property Services records show a number of the buildings as owned by a company ‘TIMEC 1235’ now reformed as ‘ES North Street Limited’. The same company is recorded as owning the listed bank, nearly listed, now demolished historic buildings at North Street and nearby historic warehouses on Kent and Union Street. Further research through Companies House shows that ‘ES North Street Limited’ shares a number of directors with the McAleer and Rushe Group of companies. McAleer and Rushe are partners with Belfast City Council on a number of significant projects including the Belfast Telegraph Building and the council’s new administrative building on Adelaide Street. 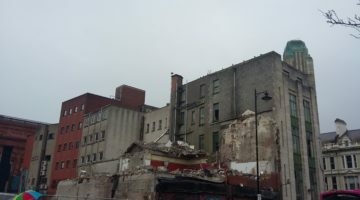 Both the owners and Belfast City Council were advised by the Historic Environment Division of the Department for Communities, of the intention to list the buildings at 95-107 well before demolition commenced in November 2016. UAHS awaits Belfast City Council’s detailed response on matters arising at North Street, and would again reiterate the urgency of the need for an across the board political will to stop damage to our National Built Heritage Asset. This is particularly relevant in the run up to the Northern Ireland Assembly election on Thursday 2nd March, 2017.